Happy New Year's fellow running and blog followers! 2015 was a good year of running for me. I started the year running from sadness, depression and pain and ended it running towards the joy of running and the fun of challenging my boundaries. I had very low mileage in January and February because of the bitter temperatures and because I hurt my back. March and April brought in a lot of panicked running so I'd be ready to endure and survive my first half marathon (13.1 miles). I ran the race in May with the goal of a sub 2:30 and I was so happy to reach that goal. I also had a great race, where I met some wonderful women to run the whole thing with. June had two more new races for me, a 10k (6.2 miles) and a 20k (12.4 miles). I went to the 10k hoping to run a sub 60 and was very shocked that I accomplished that goal. The 20k was a fun and challenging course that I hope to run again this year. July had the first of my 5k's for the summer. I set a PR that blew me away and I took second in my AG. I seriously didn't think I had that time in me. That then pushed me to see how fast I could run a 5k. I was shooting for a goal of sub 25 but I just didn't know if I could do that. August started with another PR 5k for me. I just missed sub 25 but I knew then that I could reach that goal. I worked really hard the next two weeks and blew myself away with my next PR. Our local very competitive 5k brought me another PR AND I placed first in my AG. That was the biggest surprise to me of the year so far. September had a great runcation (when you mix a race with a vacation, or in our case, we planned a vacation because of a race). I ran a goal half marathon in RI. My goal was to run it sub 2 hours. Which I did. I had a PR of 25:23 in 4 months time. Plus I got a weekend away with my love and finally got to meet a few of the incredible women from my FB running club. October. In our group all you have to do is say October and we all think of the Runner's World Half Marathon and Festival. It's the reunion of our group. We started with a trail race on Friday night. That weekend was a big race weekend for My Musician because his goal was his first sub 30 5k. I was so proud to be running right next to him when he achieved his goal. About an hour after the 5k is the the 10k. It was another PR race for me. Then on Sunday was the half marathon. This was not a PR race for me but it was an amazing race nonetheless. 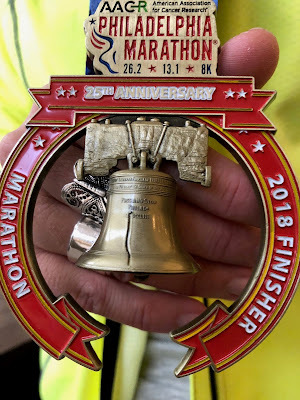 I ran it on a sprained foot (I didn't know that at the time) and finished it because of a friend running side by side with me through the whole thing. More on that when I get my race recap done. It is coming, I promise!!! Oh I also ran a small local 5k that wasn't a PR for me because it was integrated into my training run so I ran it after running 7 miles but I did take 1st in my AG and Overall Masters. November was the big race for me. My marathon. I hadn't run one since 2010 so I was pretty nervous. More details when I get that race recap done but needless to say it was overall a good race. I didn't meet my time goal but I still finished it under 5 hours! I was pretty happy with that! December was a month of recovery and much lower miles. It felt really weird not to have any races in December. I wrapped up 2015 with 1,005 miles total. I was hoping to run 1000 miles so that's another goal that I was thrilled to meet. I can't wait to see what 2016 has in store for me. I have some big goals and I'm hoping to continue to see improvement. However I know, from last year, it's going to be a lot of hard work. My Musician and I are also going to get certified in being running coaches. We've worked so much together last year that we realized we enjoyed working through schedules, paces and training together. I also have 2 marathons on the schedule for this year. That's pretty intimidating to me but it's a challenge I'm looking forward to taking on with the help and support of My Musician.